Versatile machinery dollies for turning and straight line moving. The ultimate machinery moving dollies for use in straight line moving. Perfect for light to medium duty loads requiring full directional control. 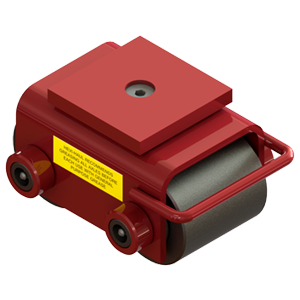 Hevi-Haul Rollers are sold in two types, steel and polyurethane coated, which are interchangeable across most models. Moves are best accomplished when rolling surfaces, such as factory floors, are clean and relatively free of debris, cracks, and holes. Always check that the surface will support the load, and reinforce weak spots with steel plates. Best choice for all ­purpose moving. 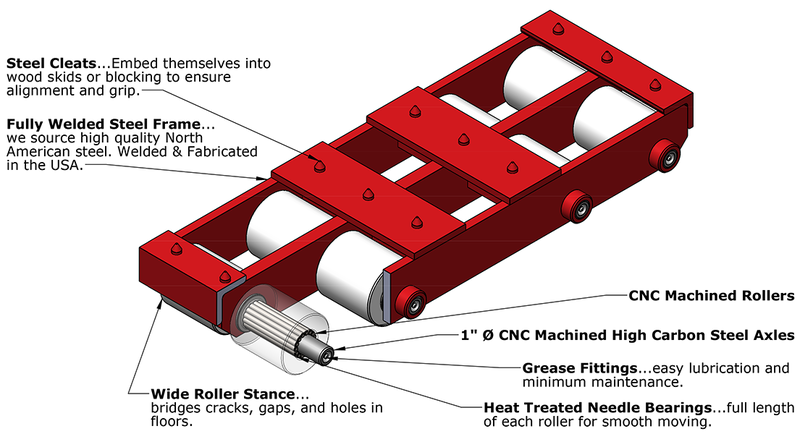 Steel Rollers provide ­maximum ­durability and can handle ­extended resting loads and even permanent ­installation. They excel in applications with rough or uneven floors. The ideal choice for floors and rolling ­surfaces that require ­maximum protection. Poly ­rollers are not ­recommended for extended resting loads or on rough and debris-riddled rolling surfaces. 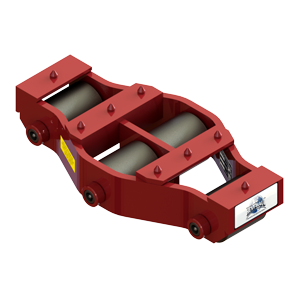 Hevi-Haul Machinery Skates are designed to move many types of heavy loads under a wide variety of conditions. Load configuration, load weight, pathway of move and floor condition are factors which help determine what skates will meet job requirements. Load configuration, physical size and shape, often dictate the number of support points required. This, combined with planned usage of skids and timbers, will help to specify quantity of skates needed. It is often necessary to use motive power, such as a forklift, to assist with moving heavy equipment. Care should be taken to determine total load weight. Plan skate placement to distribute weight and to facilitate maneuvering the load. Never exceed rated skate capacities. 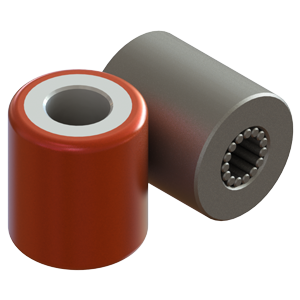 Always check load ratings when switching between steel and polyurethane coated rollers. The path over which the load will be traveled should be considered when determining the correct skate to use for the job. For straight line moves, rigid top skates are best. Swivel top skates make turns and load spotting easier. Tilting skates will generally negotiate rough or uneven floors and ramps better than non-tilting dollies. Moves are best accomplished when rolling surfaces are clean and relatively free of cracks and holes. Check to be certain rolling surfaces will support load, and reinforce weak spots with steel plates. Average ramps and inclines may be negotiated with proper motive power and restraint preparations. For extremely rough floors or unprepared pathways, steel channel may be placed to provide a track in which our skates can roll. Use available lifting mechanism to raise the load so skates can be placed underneath. 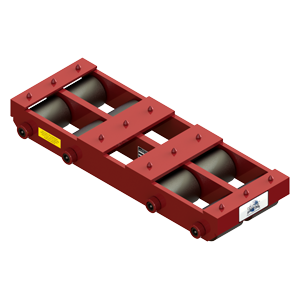 Because of Hevi-Haul Machinery Skates’ low profile, most loads can be lifted and lowered onto skates one end at a time. Hydraulic jacks may be used. Load shape and weight dictate skate placement. The object to be moved should be studied and care taken to select lifting and bearing points. Advance planning and handling can serve to avoid possible damage to your load. Wood skids or blocking are normally placed under loads prior to moving. Steel cleats, standard on Hevi-Haul Skates, will embed themselves into wood under heavy load weight. If the load is not already equipped with wood skids, place timbers between load and skates to prevent the object from sliding. Nail chocks to timbers for added slip prevention.